This coming Monday 19th October 2015, Littlest Pet Shop: Lights, Camera, Mongoose! Is coming onto DVD and Digital Download! Its doors are once again open for you to discover the fantastical world of Blythe Baxter and her talented animals. It is available in all good retailers including Amazon. 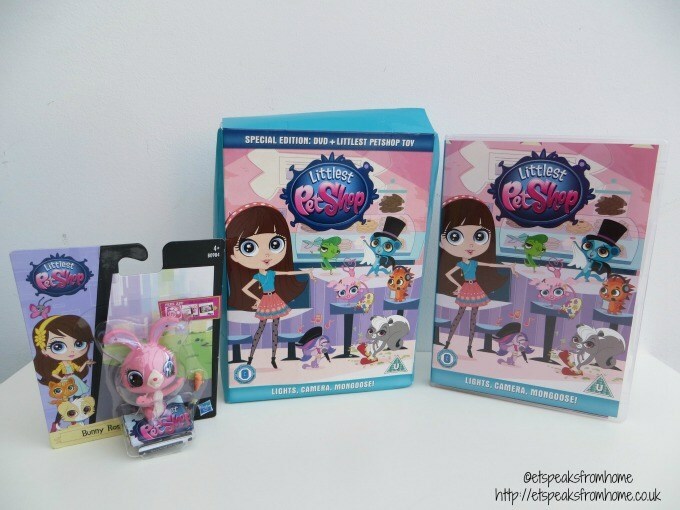 This special edition DVD contains 126 minutes of fun adventure and a Littlest Pet Shop toy! We had the Bunny Ross toy. This toy is to be used with the Littlest Pet Shop app that is available free to download on App Store and Google Play with in-app purchases. If you have not watched the Littlest Pet Shop before, it is about Blythe Baxter and her dad Roger who had recently moved into a new apartment in Downtown City above the Littlest Pet Shop. Blythe discovers that she can speak to the animals that live in the Pet Shop. In the Lights, Camera, Mongoose episode, a famous face comes to town! Mega-star mongoose Shahrukh is in New York shooting his latest film and Blythe and the pets get the chance to visit him on set. The gang have stars in their eyes until Blythe’s very own pet mongoose, Sunil, is mistaken for his celebrity peer and things take a wild turn. Our favourite little blue mongoose may have magical talents, but he cannot use his wizardry to get out of this sticky situation. Whilst Sunil is living the high life after this impromptu switcheroo, back at the shop the pets soon discover that their new celebrity guest might not be everything they had thought. Both my children love it. I was preparing dinner so I left them to watch it while I popped out at various times, and I could hear them laughing out loud at various parts of the show. I didn’t think my seven year old son would like this but he really enjoyed it. The animation is great quality and the storyline is short and sweet. I would it as the overall storyline is enjoyable and fun to watch. Disclosure: We received the sample for the purposes of writing this review however all thoughts and opinions remain our own. Contains Amazon affiliate links.